The Crafty is a pocket-sized vaporizer that’s big on flavor and quality. Made by Storz & Bickel, the same company that brought you the Volcano Vaporizer and the Plenty Vaporizer, the Crafty is everything you could ever want in an on-the-go vaporizer. It’s small, lightweight (0.3lb) and uses full convection hot air. To understand the true power of this portable vaporizer, let’s explore how the device works and take a closer look at some of its key features. 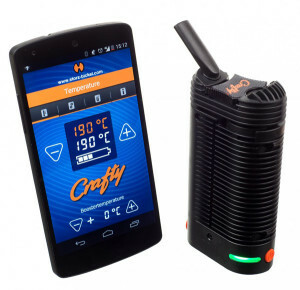 The Crafty is a lot like other Storz & Bickel vaporizers as far as its design goes. Sure, it’s compact, but it still offers the same great performance you’d expect from the brand and its signature product: the Volcano. The one-button design of this vaporizer is smart and simple. It complements the pocket-size design of the Crafty. 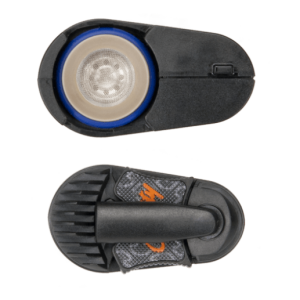 Powered by a Lithium-ion battery, the Crafty is turned on with a single button press. It heats up automatically until it reaches its default temperature. Once it heats up you’re ready to go. Want to boost the temperature? Just double-click the button. 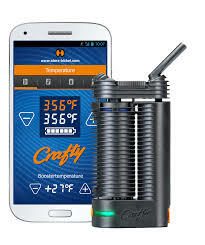 The Crafty uses full convection hot air to vaporize your material, and its precise temperature controls ensure that your material never gets over- or under-cooked. What Makes the Crafty Vaporizer Better than Other Portable Vaporizers? You know how the Crafty works, but what makes this vaporizer better than other portable models on the market? The Storz and Bickel brand is well-known for their high-quality, German-engineered products. If you’ve ever used the Volcano, the Mighty or the Plenty, you can attest to the quality of the brand’s vaporizers. Another factor that puts the Crafty ahead of the competition is the fact that it uses convection hot air to vaporize the material. What’s the big deal about convection heating? For starters, it prevents combustion. You see, most portable vaporizers use conduction heating. This means that you put the material in a filling chamber, and that chamber sits directly above the heating element. It’s just like putting a skillet on the stove top. The material is heated directly, which means it has a much higher chance of getting burned when exposed to high temperatures. That’s why conduction-style vaporizers tend to combust material – rather than vaporize it. Convection heating is different. The material sits well above the heating element, and the hot air surrounds that material, causing it to vaporize. It works just like a typical oven. And because the material isn’t heated directly, it doesn’t combust. Conduction-style vaporizers are less expensive than convection-style models, but they don’t offer the same quality, flavor and aroma – not by a long shot. You know the Crafty works, and you know that it’s better than other portable vaporizers. But you have yet to explore its inner-workings. Let’s dive right into my review, so you can see what the Crafty is all about. 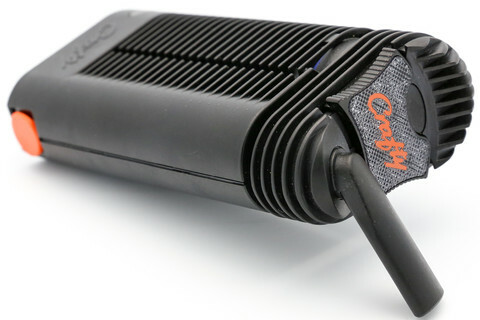 Storz and Bickel calls the Crafty a “pocket-sized” vaporizer. It’s true – it can fit in your pocket. But at 4.3” tall, it’s a bit bigger than other portable vaporizers like, say, Pax. If you are serious about vapor quality, 99% of the other portables just want meet the standard that The Crafty sets! Even at its slightly larger size, the Crafty is still easily portable. It weighs just 0.3 pounds – you really can’t get much lighter. At first glance, you might mistake this vaporizer for a walkie-talkie (at least I did). 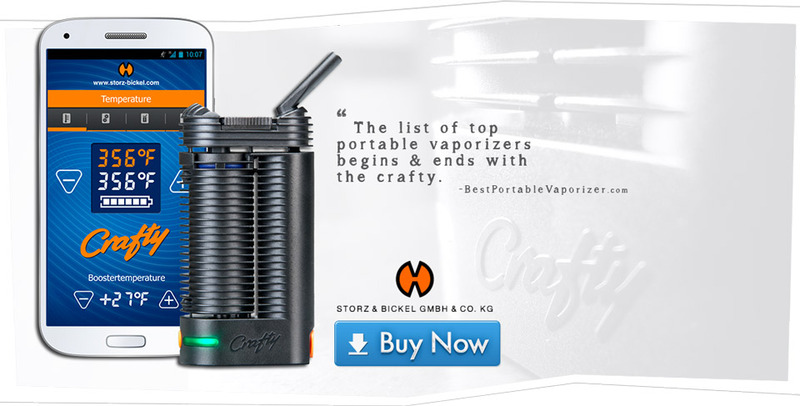 Its look is distinct, but if you’re familiar with Storz and Bickel vaporizers, you’ll notice that the Crafty’s design is an exact replica of the Mighty. It’s basically a pint-sized version of the device. If you’re like me, you’re less concerned about the size and look of a vaporizer and more concerned about its performance and quality. And the Crafty has plenty to offer in these departments. We’ve already talked about the Crafty’s convection-style heating (which is a huge selling point), so let’s take a look at its other features and benefits. Click here to see the Crafty vaporizer for yourself. Unscrew the top part of the device. All you have to do is swivel it to the side, and it comes apart easily. This exposes the herb chamber. Fill up the herb chamber. Be sure to use the nifty filling tool that helps you neatly pack your herbs. Swivel the top back into place. Press the button to turn on the Crafty and start heating up your herbs. It should vibrate to let you know it’s on. Once the default temperature is reached, the light will turn green. At this point, you’re good to go. It’s so easy to get started. The herb chamber has a generous capacity of about 0.3g, depending on how finely you grind your material. 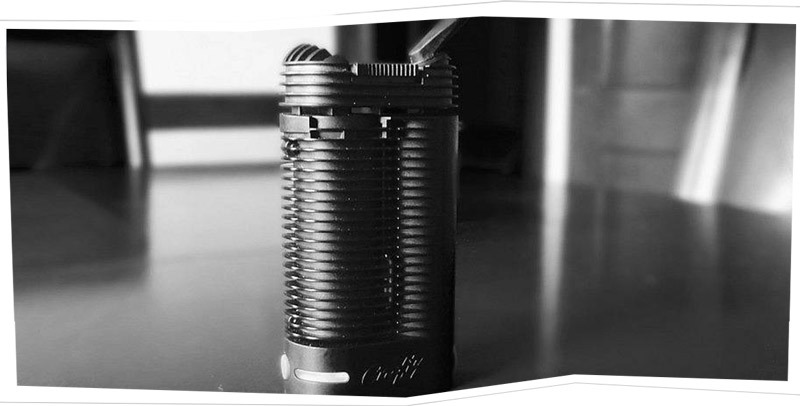 The great thing about the Crafty is that you don’t need a super fine grind to achieve good results with this vaporizer. Remember that filling tool we talked about earlier? It does more than just neatly pack your herbs. It also acts as a storage container, and it can hold enough herbs to keep you going for three sessions. 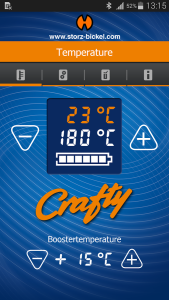 The Crafty has two temperature settings: 356F and 383F. When you first turn on the device, it automatically heats up to 356F, but you can press the power button twice to activate the boost mode. This will boost the temperature to 383F. The 356F setting is great for most herbs, and you can adjust the default temperature through the Crafty’s handy app (more on that later). The vapor produced by the Crafty is smooth and delicious. The key is to take long and slow draws (think 5-10 second draws). The mouthpiece cools the vapor as it reaches your mouth, so you’ll never experience any harsh, unpleasant flavors, and the vapor will always be cool. To get the best experience possible, I recommend vaping all of your material in one session. If you can’t do that, you can fill the chamber with less material and use the liquid pad that comes with the Crafty to keep the material in place. You don’t want the material to be loose in the chamber; you want it to be packed firmly in place. The liquid pad helps you do that, so you can enjoy just the right amount of herbs during any given session. The Crafty truly is a smart little vaporizer. It features Bluetooth connectivity that lets you link your vaporizer and the complimentary app. What the app does is allow you to modify the default temperature to whatever you choose. The Crafty will remember your settings, and always heat up to the default temperature you choose – even if it’s not connected to your phone. Aside from the temperature controls, you can also adjust the brightness of the LED lights on the device. This isn’t exactly a vital setting, but you may prefer the lights to be dimmer or brighter depending on where you’re using it. If you’re using the vaporizer and the app at the same time, the app will actually display the current temperature of the heating chamber in real time. The Crafty is, essentially, the Mighty’s little brother. And if you’ve used the Mighty, you know just how great of a compliment that is. Is the Crafty the best portable vaporizer out there?We think so. mpact. It’s lightweight. It has a high filling capacity. But most of all, it uses convection hot air to vaporizer your herbs, so you enjoy smooth, delicious vapor every time. It’s portable and cow draws, the Crafty produces big clouds, but even when taking short and gentle draws, this vaporizer doesn’t disappoint. If you’re tired of subpar portable vaporizers that really don’t give you the experience you crave, it’s time to try the Crafty. Made by the same brand that brought you a high-end vaporizer. 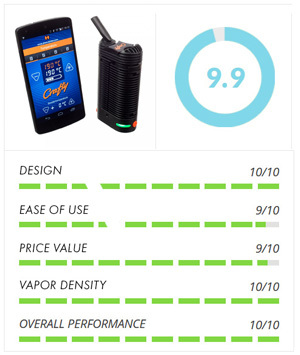 Overall The Best Quality Vaporizer We Have Ever Tested!